It all started when I (Shrishail Rana) upgraded to a new Computer, the latest one in Market. Its CPU had a Pentium II processor which was unique. It was planted and fixed on the motherboard using a daughter card just like Graphics Cards these days. It was fast. All the C++ programs on Turbo C++ were compiled very fast too. I got the Max RAM possible 64MB and 4GB HDD the max which I could get. It was Windows 95 era with Windows 98 just released a week before. The Hard Drive Disk (HDD) was partitioned in two parts of 2GB each. I soon got frustrated shuffling data back and forth between two partitions. However, I knew Windows 98 had something which could let me use my HDD as single big disk but backing up my data on floppies was a risk I didn’t want to take. Soon my PC Vendor started a service of backing up data on CD ROM. I took my PC and got all things backed up. It took half an hour to get the CD ROM burned and come out of tray like freshly baked cookies. Later, I published a page for this FAT32 experiment on a free website http://srana.virtualave.net. The problem I faced was faced by lot of people and soon traffic started flowing in. I got lot of happy emails. After three months, I started feeling that my PC was starting to slow down again. It was not as fast as before but I got used to it. I heard that you could put some extra voltage to speed up your CPU. I searched it and found it was called over clocking but not much information was available. It was risky and not many people were willing to put expensive PC on experiments which could break the PC. I tried a lot of experiments and somehow crippled my BIOS in the process. I had to convince my vendor to let me boot from a new fresh motherboard BIOS by taking the chip out. I would have to pay if anything got damaged. I took the BIOS chip, booted my PC, and removed it on running PC put my BIOS chip and reprogrammed it. After a lot of efforts and jumper settings, I was able to overclock CPU from 66 MHz to 75 MHz and improved the CPU’s inner frequency to 300 MHz. I again wrote articles on overclocking that brought a lot of traffic to my site. Blogging as such was not known then. Soon my PC experiences found a new twist. I wanted to get more RAM so I could run more programs simultaneously. While compiling and running a program (I was still a law college student then) it ran into memory leaks issues. It kept on allocating more RAM forgetting to free it and then crashing in the end. PC became much faster with such crashes. I noticed and figured out that if you allocate a lot of RAM and do not free it, Windows will empty its cache and page useless things. So, I created a small freeware program “Shrishail’s Memory Optimizer”. It got a lot of downloads and it made my hosting provider shutting me out. So, I had to move to commercial hosting with a new domain Easytweak.com with 200 MB space on a Cobalt Server. I got a lot of traffic and my program was on almost all desktops. People just clicked on the installed programme when they felt RAM was low and that did the magic. Someone from Mcafee came to advertise on my site and I got my first cheque of $6. After a year, suddenly my website was replaced with unknown pages. I had renewed the domain but my web provider forgot to do it in his master control panel. Someone took the domain as it had expired. My web provider was sorry for his mistake and offered me any new domain free for five years. I wanted to choose something related to Tweak and finally got Systweak.com. Once the site was running I started to get traffic again. It took almost four months to get past the previous levels of traffic. “I am in America buying a software product made in India with payment processing done in Germany”. 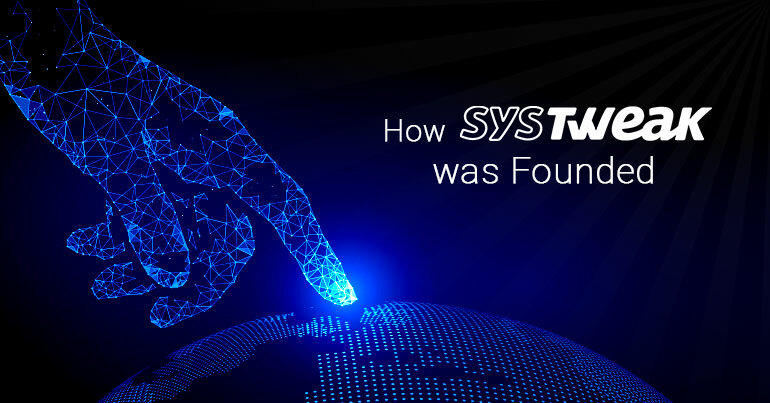 Welcome Systweak to Software World! !